A new £3 million baking academy in North Wales will be the first of its kind in the UK, First Minister Carwyn Jones was told. Mr Jones was on a visit to the award-winning Village Bakery which is celebrating its 80th anniversary this year. Work is well underway to build the Baking Academy and Innovation centre at their site on Wrexham Industrial Estate. The state-of-the-art academy will have a gym and rooftop canteen and terrace for staff as part of the family firm’s drive to recruit and retain staff. The scheme also includes office space and a specialist department to develop and perfect new products. The growing family firm, which also has a bakery in Minera, now employs 320 people. They recently announced they were introducing the Living Wage at their two bakeries in Wrexham. As a result, the minimum rate at the bakeries is going to be £7.65 an hour which is the current rate for the Living Wage. First on the agenda for the First Minister was the company’s gluten free bakery where he was met by Managing Director Robin Jones, who won the Enterprise category in the inaugural St David’s Awards and who was also recently appointed as interim Chair of the new Shadow Food and Drink Wales Industry Board, responsible for working with Welsh Government and industry to drive the delivery of ‘Towards Sustainable Growth: An Action Plan for the Food and Drink Industry 2014-2020’. They then headed next door to the bakery which makes Welsh Cakes and scones for the likes of Marks and Spencer and Tesco. The First Minister said: “It has been a pleasure to visit one of the sites of the Village Bakery in Wrexham, and to hear about their exciting plans for the future. “This is an innovative home grown company which is going from strength to strength. The workforce is valued and supported in its development and this is commendable. The firm is officially Wales’s fastest growing company after coming out on top at the prestigious Fast Growth 50 Awards. The latest accolade to be bestowed on the Village Bakery was to be named Bakery Manufacturer of the Year at the industry “Oscars”, the Baking Industry Awards, not long after being crowned Tesco Supplier of the Year 2014. According to Robin Jones, the Baking Academy and Innovation Centre was the foundation for the company’s future growth. He said: “We are delighted to have the opportunity to welcome the First Minister here today. “We are proud of our track record in generating home-grown talent. Most of our bakery managers and supervisors started out as apprentices and we want to build on this tradition. “The Baking Academy and Innovation Centre will be the only one of its kind in the UK when its ready next year. “The main function of the new centre will be to train our bakers and apprentices. There will be lecture rooms and a lecture theatre that holds more than 100 people. Our technical and commercial teams will also be based there. “Training our own staff has always been a strength of ours – we then make sure we have staff who buy in to the Village Bakery culture. “We are family focused, people focused and most of our managers and supervisors are Village Bakery people who have come up through the ranks. “This year is a really big year for us. We are celebrating the 80th anniversary of the Village Bakery but we’re certainly not resting on our laurels. 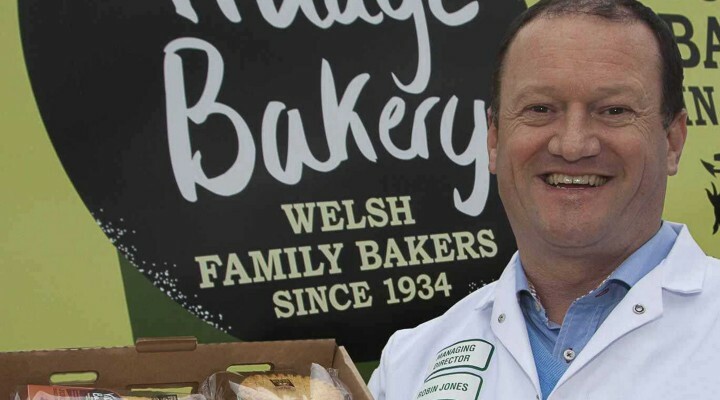 “We have just completed a major, all-encompassing rebranding of the Village Bakery to emphasise our ethos of quality, our commitment to local sourcing, our credentials as craft bakers and to underline our Welshness. “I’m glad to say the new branding has been a big hit with our customers and will help make our products even more popular. “We’re now also exporting a lot of what we make – our scones and pancakes are now available as far afield as Hong Kong, Dubai, Singapore and India. Our gluten free products are exported all over Scandinavia and Europe. “We have worked closely with the Welsh Government over recent years and have benefited from their assistance to help pump prime our expansion. It’s been a great partnership that’s helped create new jobs and boost the local economy. This entry was posted in Business, Education, Featured, News. Bookmark the permalink.